For the past few years E-ink's signage offerings were limited to either a 13" or smaller flexible Mobius E-ink screen, or a 32" and up inflexible screen. Now E-ink has combined the two. 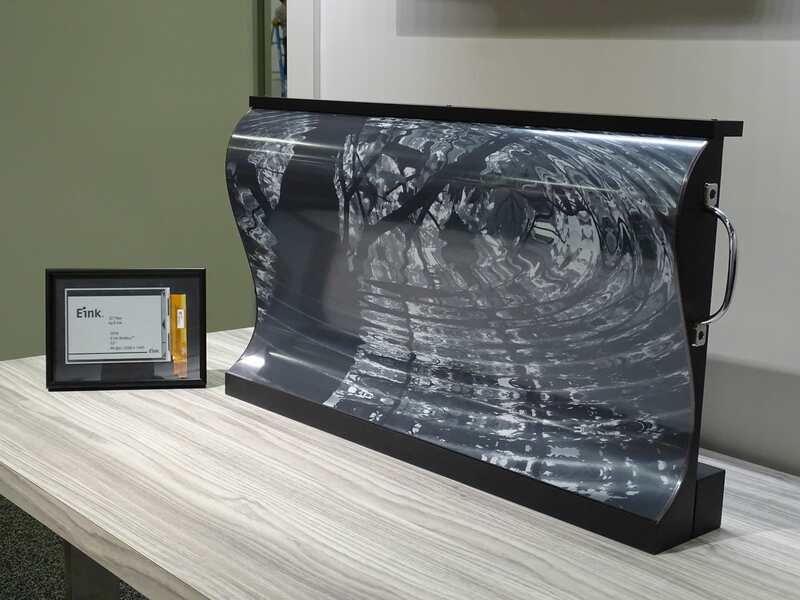 The screen manufacturer is in San Francisco this week at SID Display Week, where they showed off their new flexible 32" Mobius E-ink display. The 32" Mobius display weighs 150 grams, and has a screen resolution of 2650 x 1440 (the same as the earlier 32" screens). It can't be rolled and unrolled repeatedly, but it can be wrapped around a pillar or other one-dimensional curved surfaces (i.e. wrapping it around a ball won't work as well). It has all the paper-like readability and low power consumption of E-ink displays, and will not add a significant power load on the system. It can even be powered with solar cells and rechargeable batteries. "E Ink Mobius displays offer a unique solution for public information systems and other digital signage applications," said Harit Doshi, E Ink's head of the signage business unit. "The flexibility, lightweight and low power requirements of the 32" Mobius display make it an ideal drop-in replacement for the existing paper or plastic systems in present use. Operators can upgrade their systems to provide greater customer service without having to make major infrastructural changes." That's great, but the fact of the matter is E-ink has lost most of the signage market to LCD and OLED screens. Walk into your local movie theater or fast food, and if they have electronic signs then the odds are good that you're looking at LCD or OLED or something similar, and not E-ink. Sure, E-ink has its benefits but it's simply not as pretty or fast as the competing screen tech, and frankly E-ink's one strength (power) matters less than speed and color quality. Concerning the signage-type market, e-ink does have a unique advantage: low-power. Stick one of these up with circuitry and solar-cells to power it, and it should work without maintenance for years. Could be handy in the desert? One concern I have is that the display will have to covered. Would that impact readability? Anyway, my point is e-ink has a unique selling point, and as long as it can find a niche big enough, it can prosper and develop. I think it would be great to have these as home style chalk board / calendar thing, something that can be refreshed with info every few minutes, kind of like the dashboard in Mac OS. Or as a replacement for the old school desk pad/daily planner granted it would need to be attached to content. easily enough to be a small computer. To have content on it that is potentially just reference notes and other things that don’t need to be continually refreshed.